The mysterious Mrs. Kribs is on the left, Mrs. Katz is in the middle on the right. I had the illusion of a healthy dinner tonight. We went to Izzy’s Steaks and Chops, in San Ramon. 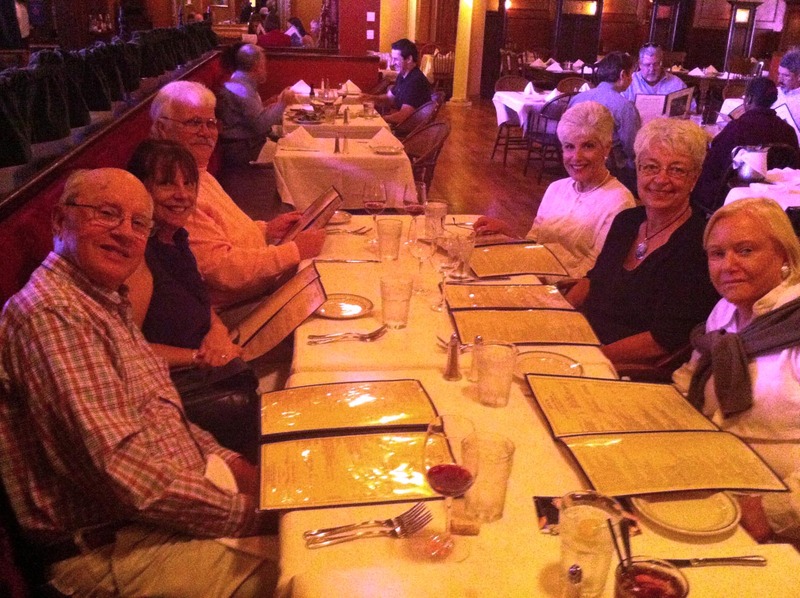 The occasion was dinner with Pam Katz, the Bandlers and Buzz Kribs and his wife Janice. Yes, the mysterious Janice who I’ve only met 4 or 5 times in all the years I’ve known the Buzzard. She’s really very nice, and I’m not just saying that because she is a loyal reader. Pam Katz is doing fine. Grandson Aaron is 3 now, son Andy is married and going to graduate school, daughter Jodie is happy and healthy. Pam went to Spain for a wedding a while back, and is off on an Italian adventure next month. Izzy’s, at the corner of Bollinger and Alcosta in San Ramon, is an old-fashioned steak house, specializing in large slabs of meat. Gail had a Prime Rib, and I saw no leftovers. Buzz demolished a filet, Mike also had a Prime, everyone had BEEF. Being a contrarian at heart, I ordered the halibut, thinking that it would be the wiser and healthier choice. Silly me. The halibut was one of the best I have ever tasted, but I suspect that the pound of butter they coated it with had something to do with the excellent flavor. Toss in the baked sweet potato (so-so) and the creamed spinach (better than excellent), and I had a heart attack on a plate masquerading as the heart-healthy choice. Wisely, we passed on dessert. Izzy’s is a fine restaurant. Just don’t tell you cardiologist where you’re going.